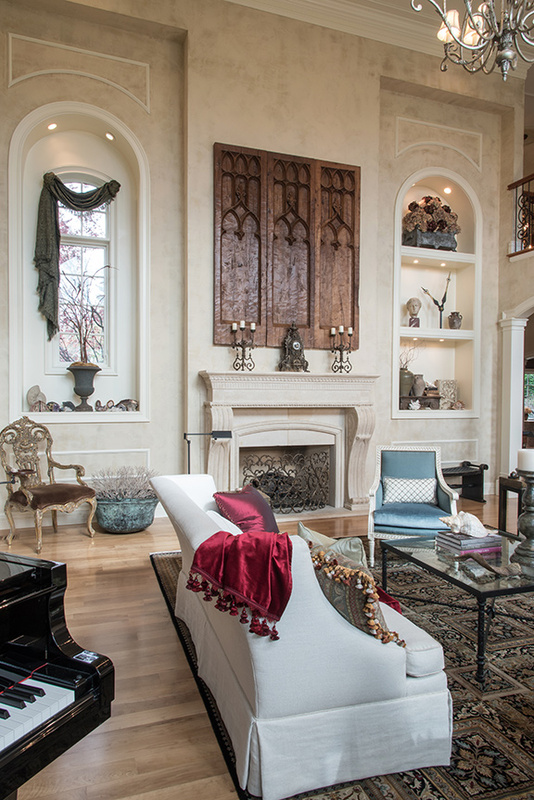 Building a collection of unique furnishings and accessories takes time, and these Creve Coeur homeowners and their designer carefully selected each piece. The expansive great room shows off the home's Old World-style with fabulous pieces including the three wood-carved doors above the fireplace. 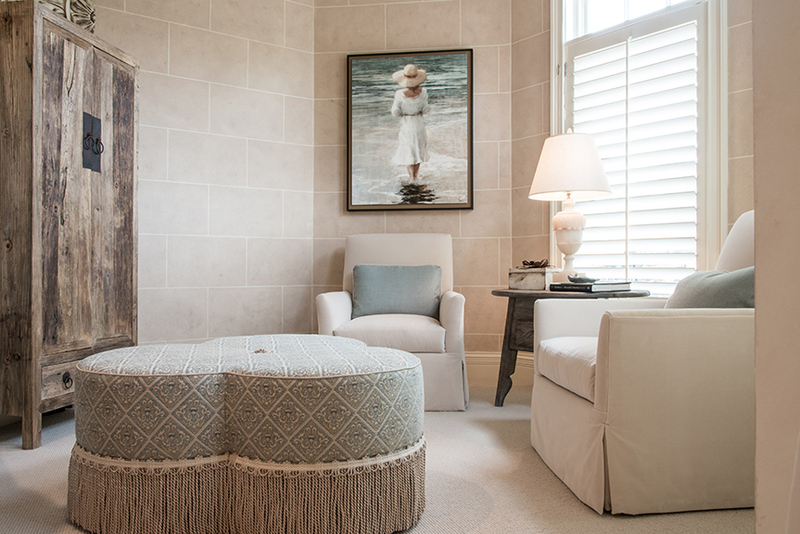 A neutral base is layered with subtle touches of color. The designer and homeowners find interest in beauty in natural objects. 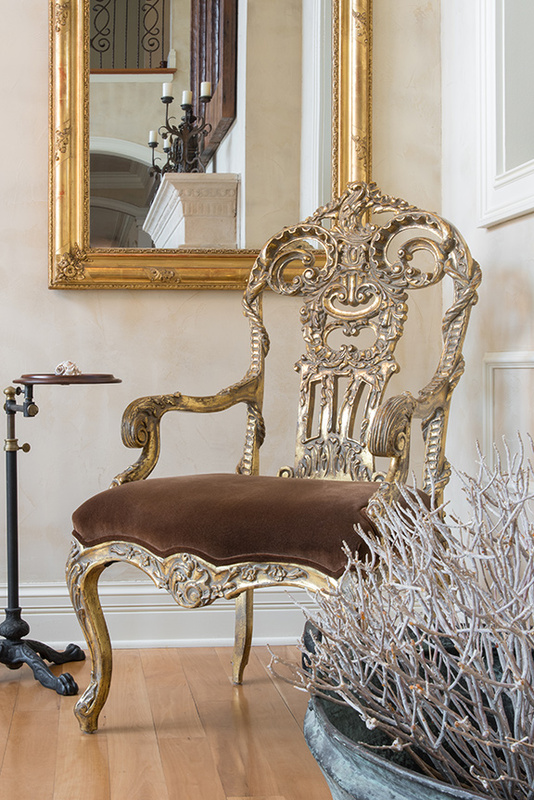 The Italian gilt armchair is referred to as the "Queen's Chair" by the owners, who love it for its gold color and fine fabric. Stone-and-steel end tables from Suttonwood introduce a contemporary element into the great room. The painted wood panel above the stairs was found at Robert Morrissey and ties together the color scheme. 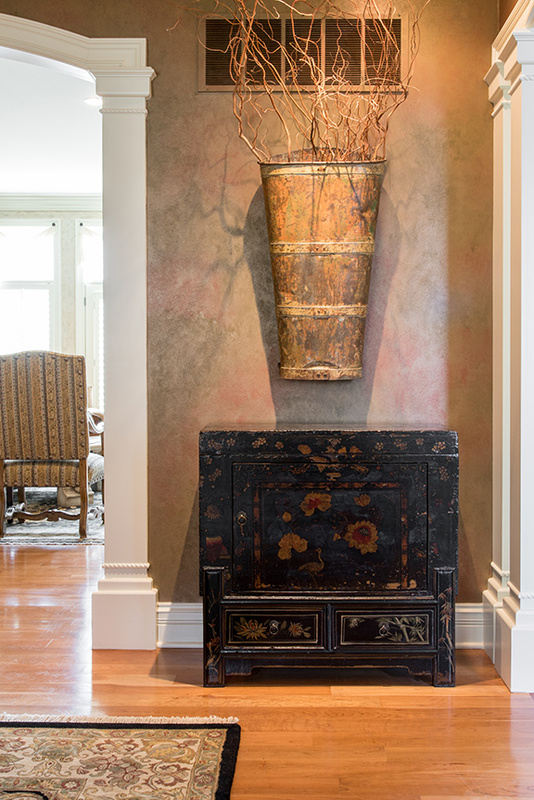 A metal grape carrier once used in a vineyard in France was originally intended for the wine room, but found a new home in the dining room. Mercury bottles Renée found in New Orleans line the hand-made dining room table. 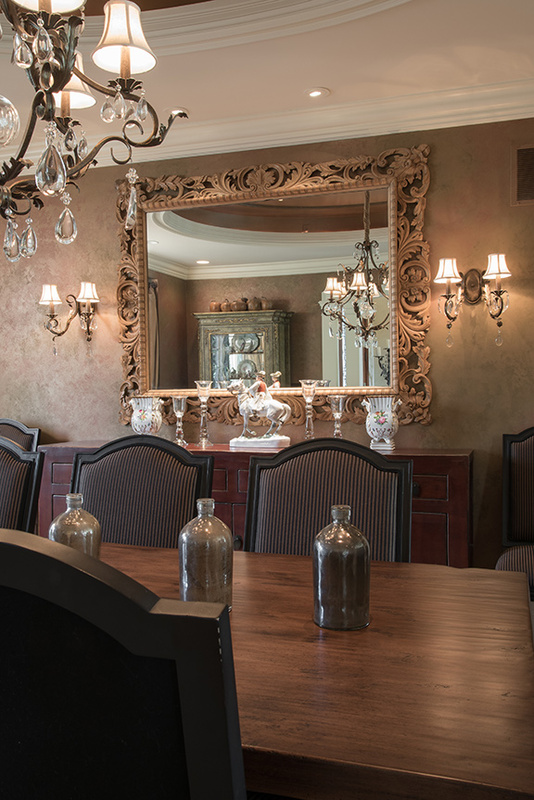 A cabinet positioned below a gorgeous mirror from Robert Morrissey displays more of the homeowner's precious pieces. A trompe l'oeil skylight by Roland Brechwoldt lights up the hearth room dining area and was inspired by the two red-tailed hawks the homeowners saw when initially viewing the land. 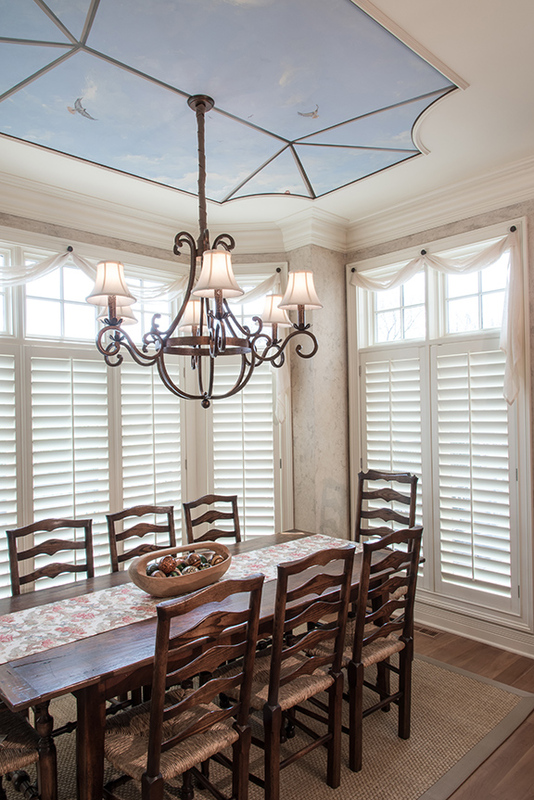 A dramatic wall and ceiling treatment complements the rich fabrics and accent pieces in the dining room. In the entry foyer, a grand candelabra from R. Ege Antiques and a statue originally intended for the outdoor space greet guests. The walls of the master bedroom turret were painted to resemble stone. 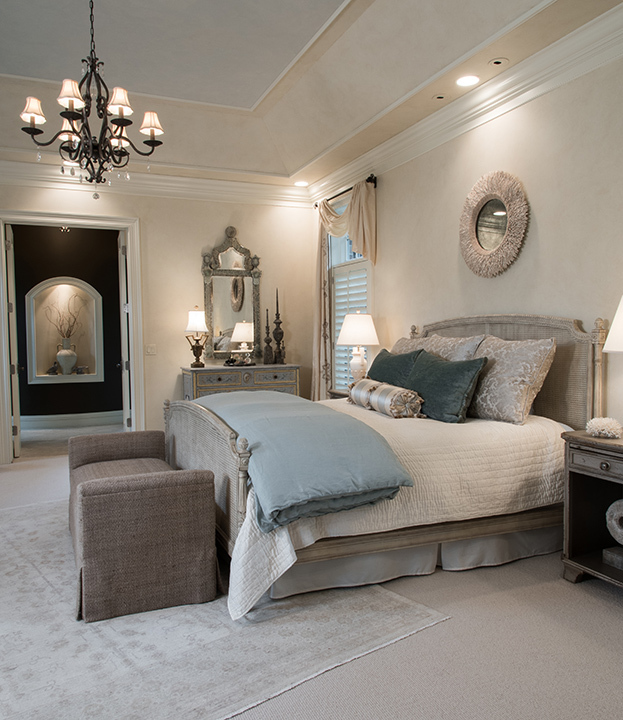 The master suite is light and airy with a variety of textures including the coco-shell and mercury glass mirror above the cane headboard from Edward Ferrell + Lewis Mittman and stone side tables. For most homeowners, furnishing and decorating a new home doesn’t just happen overnight, it evolves over time. Such was the case for Tom and Susan Csengody, who after nearly nine years in their Creve Coeur residence are still adding, replacing and fine-tuning their grand design. Having just laid out plans to renovate their previous home, Tom and Susan happened to drive by a piece of land they had admired for years and on a whim decided to check it out. As luck would have it, the land was being divided into three lots for sale. Standing on what would soon be their new home, two red-tailed hawks circled the 2-acre plot and pond and the Csengodys thought, “this is a sign!” With the chance to build their dream home in a private wooded setting, they chucked the renovation plans and jumped head first into building their new home with high ceilings and open living spaces. When construction was completed, the couple called on interior designer and family friend Renée Flanders to help with the decorating. “We like Old World, antiques and a warm, soft feel,” Tom says. “Renée specializes in that style with a bit of quirkiness thrown in,” adds Susan. They appreciated the surprises she would bring to the design, which pushed them outside of their comfort zone and resulted in a stunning home bursting with worldly influence. The transformation didn’t happen overnight. Still acquiring new furniture and décor pieces some nine years later, the homeowners and designer both laugh when acknowledging the need for patience in the process. “Some things took years to find,” Tom notes. One prime place that stood bare for years was the wall above the fireplace in the great room…a prime piece of decorating real estate. Nothing seemed right for the spot until Tom, Susan and Renée were visiting Rick Ege Antiques in Soulard where they stumbled upon a set of three gothic wood doors from Belgium that, after a French-polish treatment, became exceptionally beautiful. They were just the right size and had so much more personality and interest than any painting or decorative piece they had seen so far. Though the fireplace wall took years to complete, the design concept in the great room began with the oriental area rug, which inspired the color palette for the rest of the space. Mainly neutral furnishings with pops of color like soft blues and bold reds allow the detail in the antique pieces to shine. Texture, which Renée says is just as important as color, also played a large role in the overall design elements of the home. Matching stone-and-steel end tables from Suttonwood Antiques "add a little touch of contemporary that we needed for simplicity and to balance out the great room,” Renée explains. 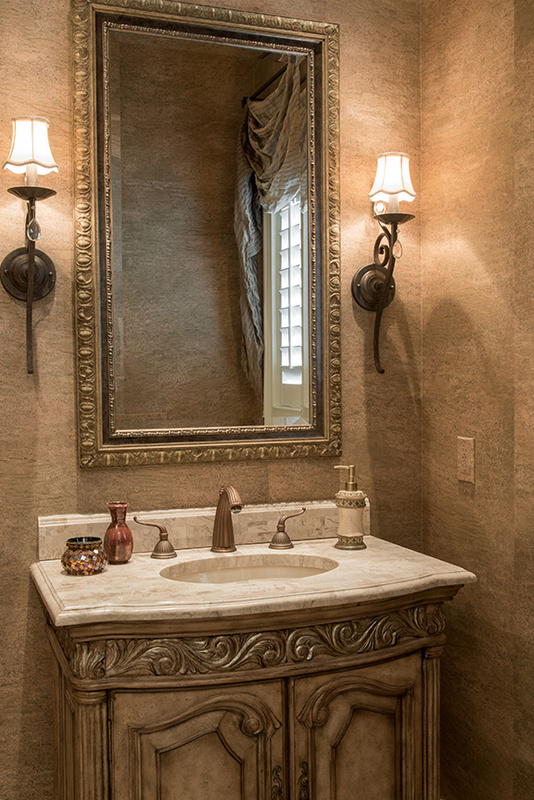 The illusion of texture also comes into play in the decorative wall treatment. 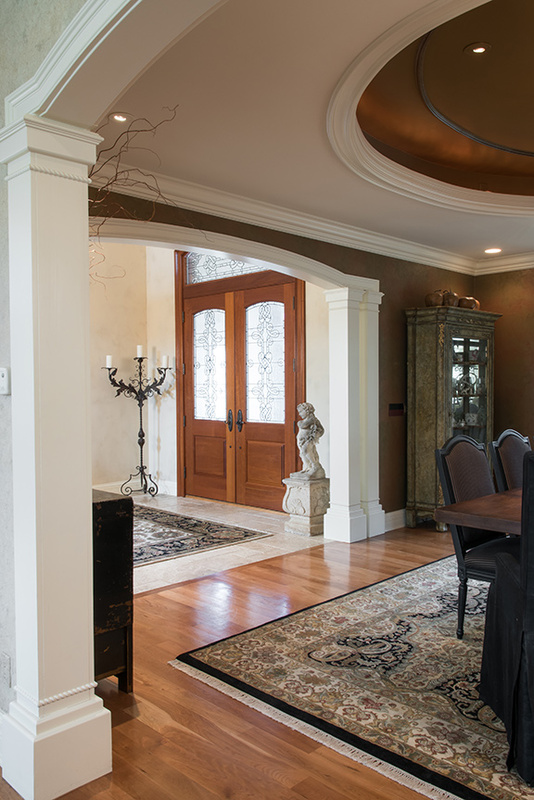 Previously a flat color, Renée suggested adding French flavor to the main level with a technique resembling a thick plaster that will last forever and brings texture and warmth. To fill the expansive wall spaces in the open floor plan, the trio got creative. A beautiful wool-and-silk tapestry hangs on one wall in the great room, while an antique wood panel found at Robert Morrissey occupies a blank space visible from the great room and in the open stairwell. A dramatic, decorative Old World wall treatment hand-painted on the dining-room wall and recessed ceiling dome warms the space calling for equally rich fabrics and accent pieces. The dining room table was hand-made in the United States by Farmhouse Collection and is accented with French Louis XVI chairs and two distinct host chairs in a waxed black linen for an eclectic look. Antique mercury glass bottles, found by Renée in New Orleans, line the center of the table. The Csengodys appreciate that Renée is always thinking about their home in the back of her mind as she is traveling and shopping. “These are one of my favorite accessories, and I love to fill them with seasonal décor for each holiday we host,” Susan says. Other striking antiques include a Chinese sideboard from Suttonwood Antiques set beneath an ornate French Louis XV mirror from Robert Morrissey, a grape carrier from a French vineyard found at R. Ege Antiques, and a towering antiqued column from KDR Designer Showrooms. The open kitchen, hearth room and breakfast nook echo the same warm color palette found throughout the home and are accented with natural materials such as grasses, wood, clay and stone. 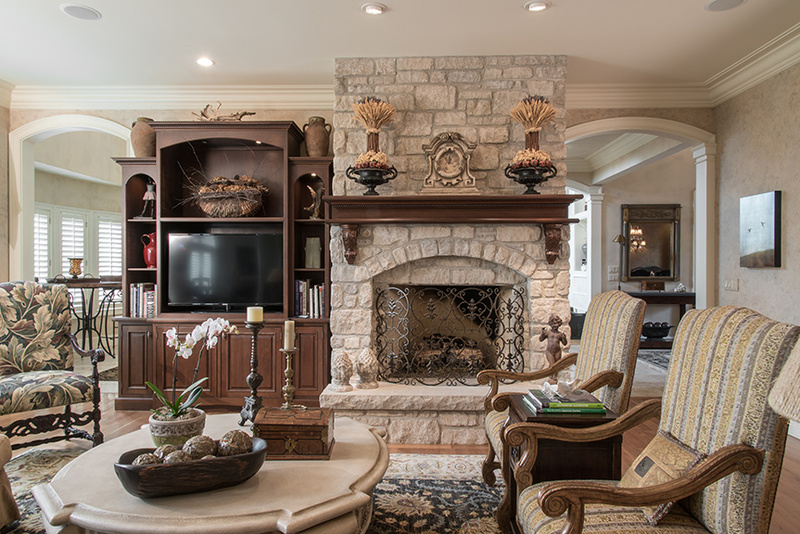 Amphora pots dot the built-in shelves and fireplace mantels. 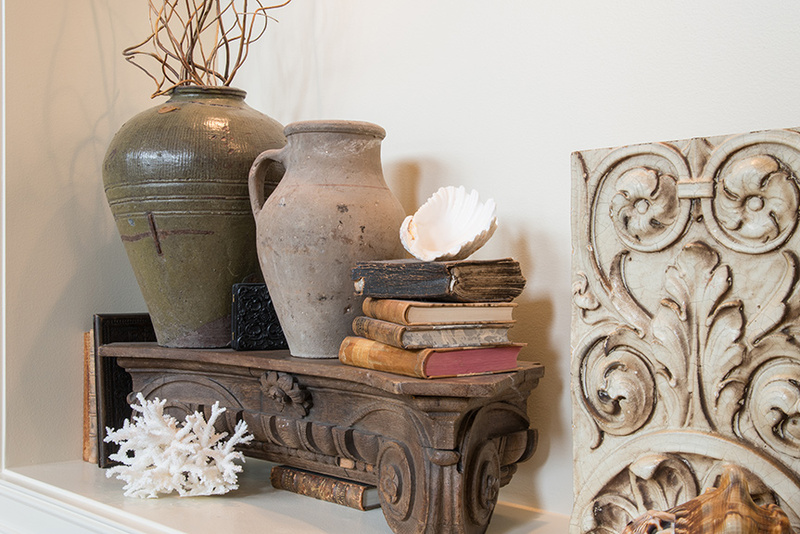 Both designer and homeowners note that antiques can often be bought at a fraction of the cost of new reproductions. The home is a mix of expensive and bargain finds. And, of course, sometimes things are purchased with a certain spot in mind and in the end find their calling somewhere else, like the cherub statue in the entry foyer originally intended for their outdoor space. “It just kind of worked here,” Susan says. A powder room with a hand-painted silk wallcovering and Susan’s office turret layered in texture (silk, chenille, tapestry and leather), complete the main living spaces. The private master suite, with its sky blue ceiling treatment, is tucked to the side of the great room and is a light and airy breath of fresh air from the muted colors on the main floor. 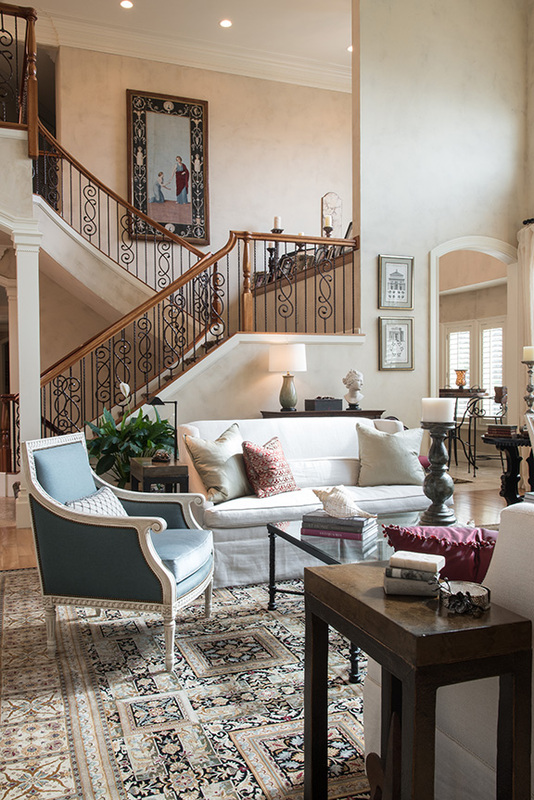 An ashra rug, with a soft and subtle antique-washed look, was set on an angle to mimic the architectural lines of the adjoining turret and elongate the room. Rather than the expected painting above the bed, Renée found a beautiful and natural coco-shell and mercury glass mirror for a simple addition. The adjoining turret was painted to simulate stone, which sets the space apart from the bedroom. And over the past nine years, ideas have flown freely between the design trifecta because they work well together and appreciate one another’s thinking. 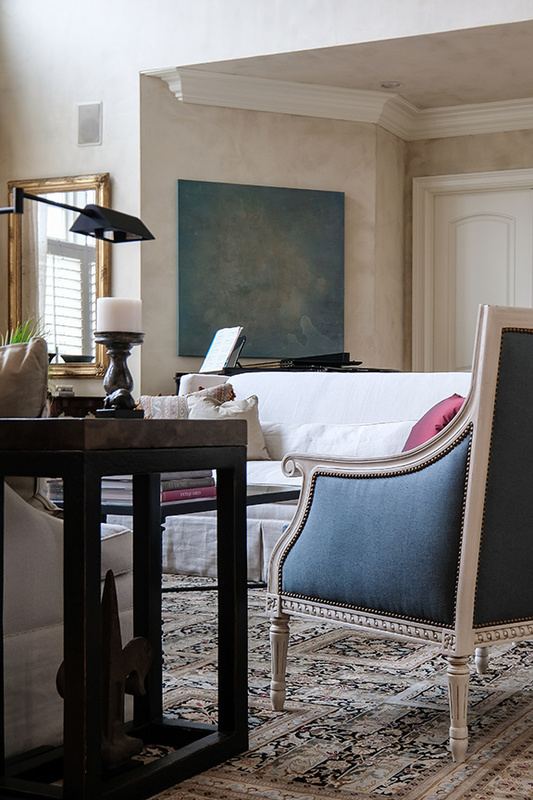 Taking their time to meticulously select their furnishing and accessories from sofas to table objets d'art, the Csengodys truly appreciate the home they’ve built and the meaning behind each item. An end result Renée is proud of. “A successful home tells the story of the people who live there, and this home very much describes Tom and Susan and the wonderful people they are,” Renée exclaims with a smile.